Is Lost in Space just Lost, In Space? The Robinsons are back and they’re just as lost as ever. Netflix has rebooted Lost in Space for the second time, throwing out the silver spandex and the shuffling robot for explosions, aliens, and slick drama. The original Lost in Space was made at a time before humanity let slip the bonds of gravity and touched the face of God. The 60s were characterised by many political turmoils, but over it all hung the space race between America and Russia. It’s no surprise then that the original Lost in Space, before all the campy fun began, started off with a political bang. Much like Star Trek was, Lost in Space was a product of its time so it’s unsurprising that the Russo-phobia of the day made its way in via Doctor Smith, who in the original worked for a ‘rival nation’ and who sabotaged the Jupiter One as it made its way into space. The new Lost in Space doesn’t have that context for itself, it’s a show about being well, Lost in Space, but that’s about it. It manages neither the depth of having a political context, nor the frivolity and fun of the original. Spoilers below this point, so please if you haven’t watched the programme, close this page now. Lost in Space 2018 suffers deeply from Netflix syndrome which you’ll be very familiar with if you’ve watched any of the recent Marvel shows. There’s nothing in the way of a compelling antagonist and the whole thing, despite being a truncated ten episodes, outstays its welcome by at least a couple of hours. Doctor Smith in the reboot has moved from diabolical yet cowardly villain (with an eventual heart of gold) to a conflicted career criminal who pounces upon any weakness like a circling vulture. Played ably by Parker Posey this character is just too unbalanced to be a credible threat to the crew, and only by the family Robinson being incredibly dim does she wreak any particular antagonism. The Robinson family is remarkable for being entire unlikeable and whose attitude to being on an alien planet is only matched by the crew of the Prometheus. Throughout the series the only peril that really occurs comes from their own actions or inactions, always at the wrong time. It’s almost a farce, laugh along as the Robinsons drive too fast down a hill into a tar pit, clutch your sides as they blast into space for…no reason, chuckle as they destroy everyone’s fuel to save The Worst Characters’ life. Really the only danger in space is being anywhere near the family Robinson, if you see them coming, space-run for your life. Overall the peril that they and the other colonists (another revision from the original series) face tends to be very low-grade, it’s only near the end of the series does actually leaving the planet become a priority; the rest of the series proceeds with the pace of treacle trickling down a spoon. The robot’s had another reinvention, coming in the form of an alien many-legged creature which reforms itself into a much more humanoid looking android. This robot also suffers in the reboot, being utterly controlled by Will Robinson at the start, to being rebooted into an evil version by Dr Smith later on. Neither version is particularly compelling, looking more like the 90s live-action Guyver rather than an invention from an alien mind. The aliens tie into the meta-story, because (as always seems to be the way now) the story you get in Lost in Space isn’t the one on the surface. There’s a government conspiracy! Aliens who are evil, but actually wronged! Stolen technology! And none of it really matters, it’s just window dressing on ten hours of watching idiots make idiot decisions on planet idiot. With many colonists being stranded on this planet rather than just the family, multiple flashbacks to characters’ pasts that don’t illuminate anything of value, and an overarching plot that aims for mystery where there is none, Lost in Space feels much more like Lost at its worst, first half of season 3 Lost. If you know Lost, you’ll know that’s some bad Lost right there. Lost in Space is something to be endured rather than enjoyed, with the only glimmer of light being in the last few seconds where it almost dares to morph into a more interesting tv programme, only to be truncated by end credits. It feels like a missed opportunity as the Lost in Space idea is something compelling, but one that here has no life and no energy to it. Lost in Space is a turgid mess, and although pretty and well acted, misses its potential considerably. 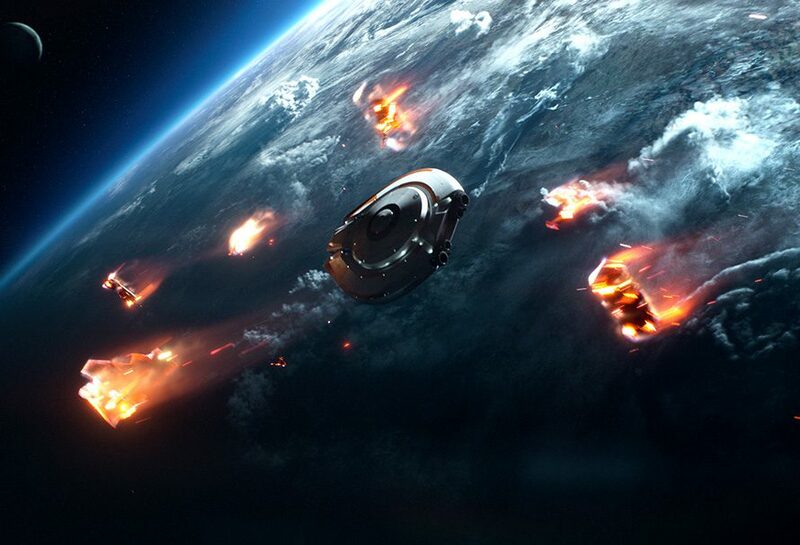 Lost in Space is available to watch on Netflix, right now. Previous article Pillars of Eternity II: Deadfire - Worth A Buy?